Muslim American voters favor one GOP candidate over others, according to CAIR - guess who? 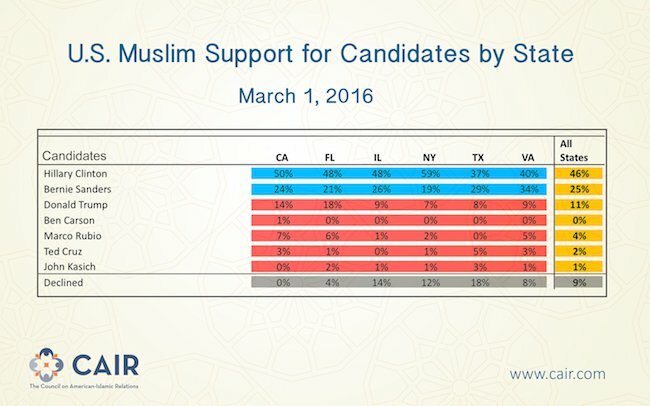 Muslim American voters favor one GOP candidate over others, according to CAIR – guess who? Of the Republican presidential candidates there is one that stands out head and shoulders as most preferable among Muslim Americans, and it’s not Sen. Marco Rubio. It’s Manhattan businessman Donald Trump, the man who would deport all illegal immigrants and put at least a temporary end to the influx of Syrian refugees. The Council on American Islamic relations, or CAIR, released the results of a poll this month. It found that 11 percent of all registered Muslim voters favored Trump, far and above greater than the combined percentages of the rest of the GOP field, Journal Review’s Mike Miller reported. The survey, conducted March 1, interviewed in excess of 1,850 Muslim voters. Sen. Marco Rubio of Florida came in a distant second at four percent, followed by Sen. Ted Cruz of Texas at two percent and Ohio Gov. John Kasich at one percent. Those are just the Republicans. Democratic presidential front-runner leads the entire field at 46 percent, followed by Sen. Bernie Sanders of Vermont at 25 percent.